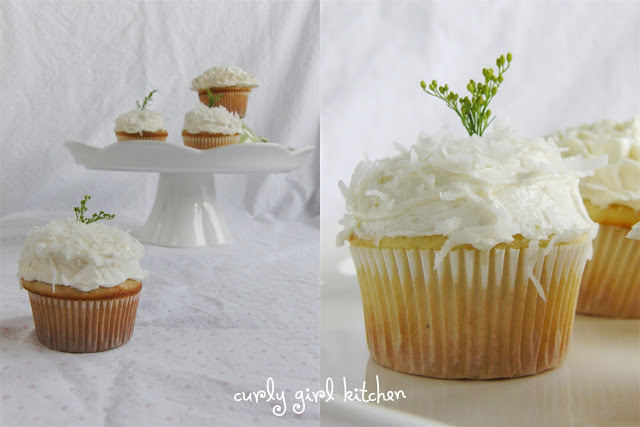 The house was filled with the sweet scent of cake and lemon and coconut the morning I baked these - there's no air freshener that can sweeten up a home like something freshly baked, cooling on the counter. All those buttercream ruffles were almost too pretty to eat. Almost. 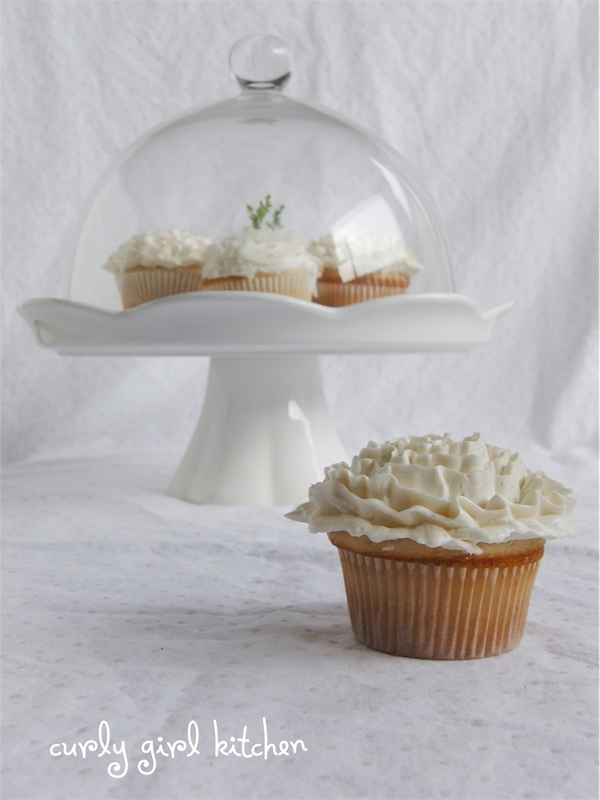 The soft, white coconut cake was sweet and delicate, filled with tart lemon curd, and then topped with a fluffy lemon buttercream. 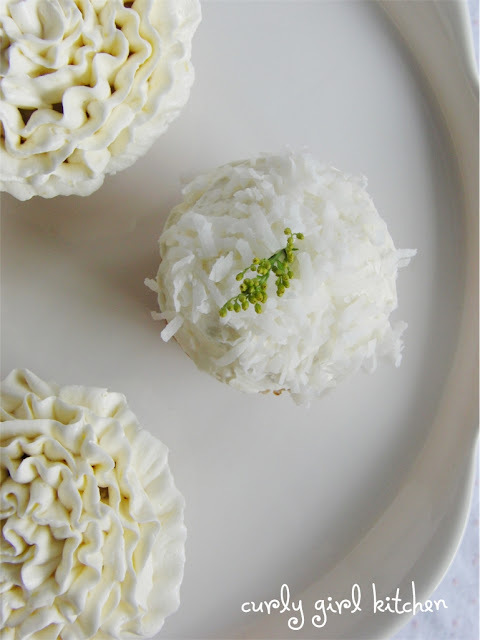 I decorated a few with buttercream ruffles, and then gave a plain swipe of buttercream to the ones I topped with sweet coconut. 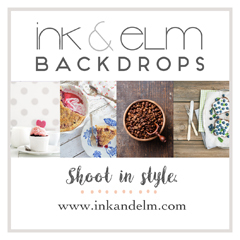 I sat on the couch with my friend Katie and her pretty baby girl Macy, talking about photography, and we each sampled a cupcake with our cups of coffee, just to make sure they were good. I had baked them for Jamie, but he wouldn't be coming home until the next evening. Katie had asked me to assist her with photographing an upcoming wedding, so we were spending the day talking about the schedule for the day, the different types of lenses and the settings on her camera, which I was going to be borrowing. With no professional photography experience, and no experience at all with using a DSLR camera, changing lenses and using a camera on its manual settings, I had so much to learn before the big day. The morning of the wedding was warm and sunny, and we were up early to set everything up at the Brown Palace Hotel in downtown Denver. And then the next eight hours were filled with photo shoots of the bride and bridesmaids getting ready, family portraits, the ceremony, guests, the cake cutting and dancing. It was work, but also a lot of fun, and interesting to see a wedding through the lens of a camera instead of as a guest. And although I didn't even know the bride and groom, I found myself tearing up more than once during the toasts at the reception. The family was warm and welcoming, with so much energy on the dance floor. Back home, I was so tired that I fell asleep on the couch for 2 1/2 hours, waking to the aroma of the pot roast Jamie had started cooking for dinner. How wonderful is it to be with someone who starts dinner while I take a long nap, and then rubs my aching feet? I haven't seen any of the photos from the wedding yet, but once they're ready, Katie will post a sampling on her blog, Kathleen Rose Photography. Maybe it was all the wedding talk on my mind, but when I started decorating the cupcakes, I decided to cover them with ruffles of buttercream. I thought that even the cupcakes looked bridal. Preheat the oven to 350. Line muffin tins with 24 paper liners. In the bowl of your stand mixer fitted with the paddle attachment, combine all of the cake ingredients. Mix on low to combine, then mix on medium speed for 3 minutes, scraping the bowl once. Divide the batter between the muffin cups, filling them 2/3 full. Bake for 15 minutes, until pale golden and a toothpick comes out clean. 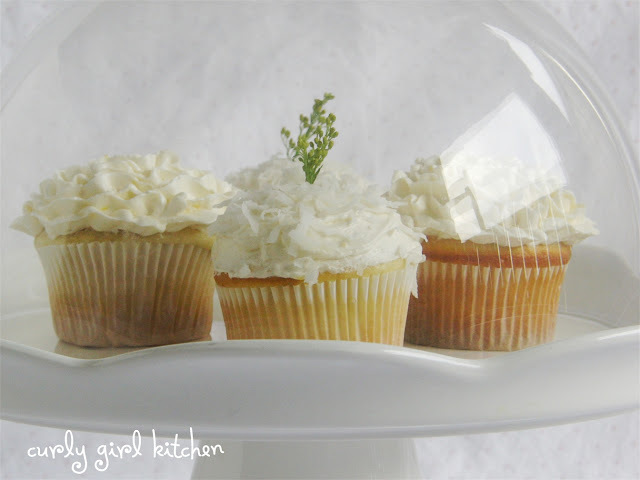 Remove cupcakes from the pan and set on a wire rack to cool completely. In the bowl of your stand mixer fitted with the whisk attachment, mix the butter, lemon curd and lemon zest for one minute. In a separate bowl, combine the powdered sugar and meringue powder (meringue powder should not directly touch any liquid); add to the mixing bowl and mix on low to combine. Add the vanilla and milk, then increase speed to medium high, whipping for 4-5 minutes until very light and fluffy. If you have a cupcake corer, great; if not, do what I do and poke the blunt end of a chopstick into the center of each cupcake, stopping halfway down, and swirl it around to create a half-inch hole. Pipe about a teaspoon of lemon curd into the holes. Pipe or spread the buttercream onto the cupcakes. 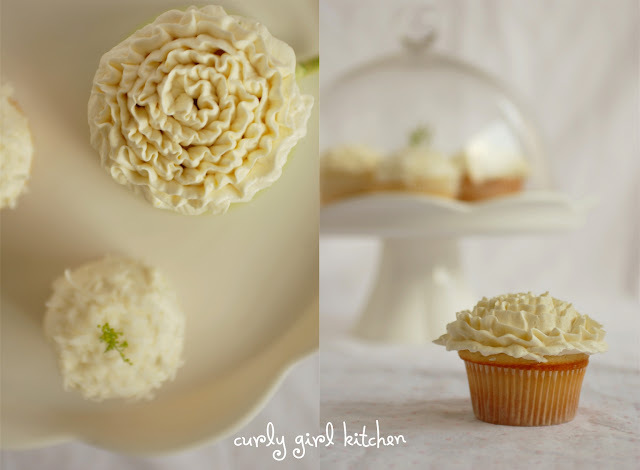 To achieve the ruffled look above, use the Wilton #104 rose petal tip fitted to a piping bag. 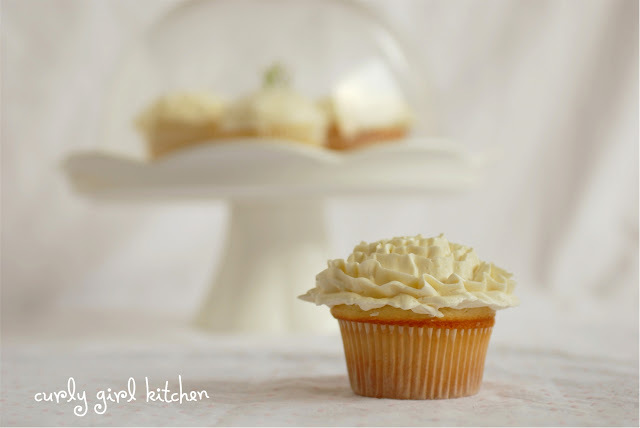 Hold the bag so the tip is vertical, narrow end up and wide end down, against the cupcake. Starting at the middle, squeeze the bag with one hand while you turn the cupcake with the other (I'm right-handed, so I held the piping bag with my right hand and turned the cupcake counter-clockwise with my left). Wiggle your hand a little (the one holding the bag) to create ruffles, and pipe in a circular pattern from the middle to the outside. 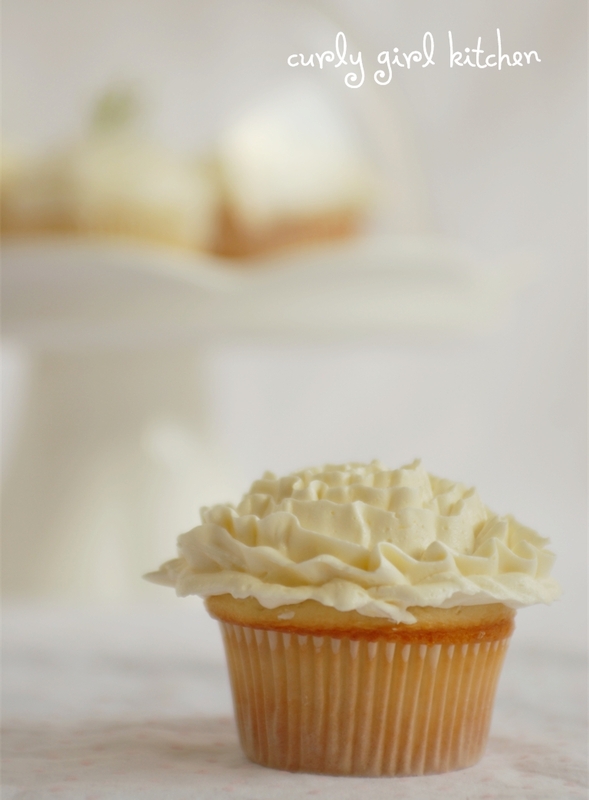 For the last ruffle on the outer edge, angle the tip at a 45 degree angle, with the narrow end pointing away from the cupcake. 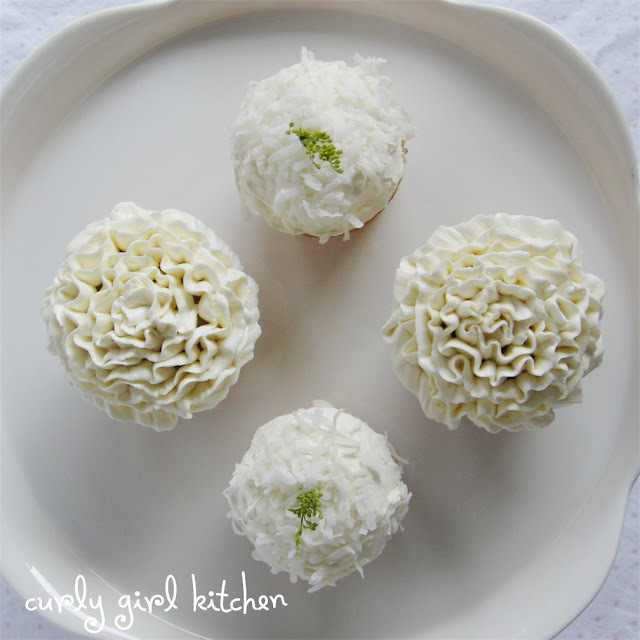 Sprinkle cupcakes with the coconut, if you don't mind covering up the pretty ruffles. Toast the coconut first, if desired.